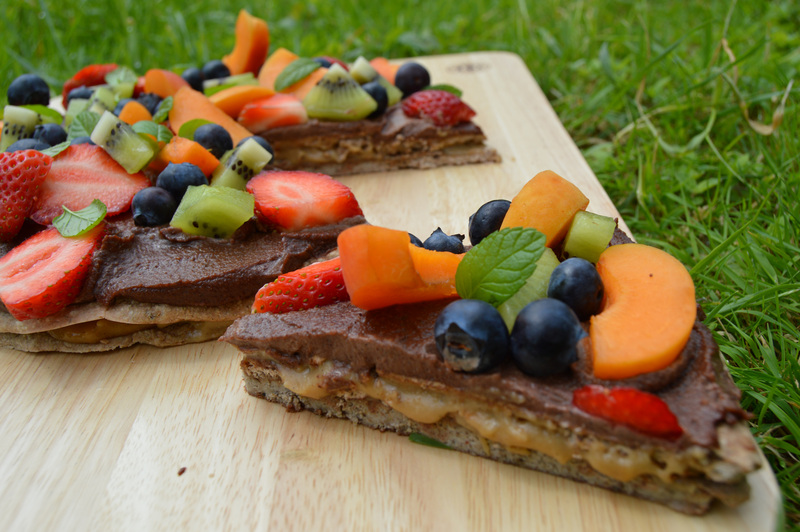 Buckwheat banana bases sandwiched with cashew caramel, topped with hazelnut chocolate and fruit. Just made from fruit, seeds, nuts and maple syrup. 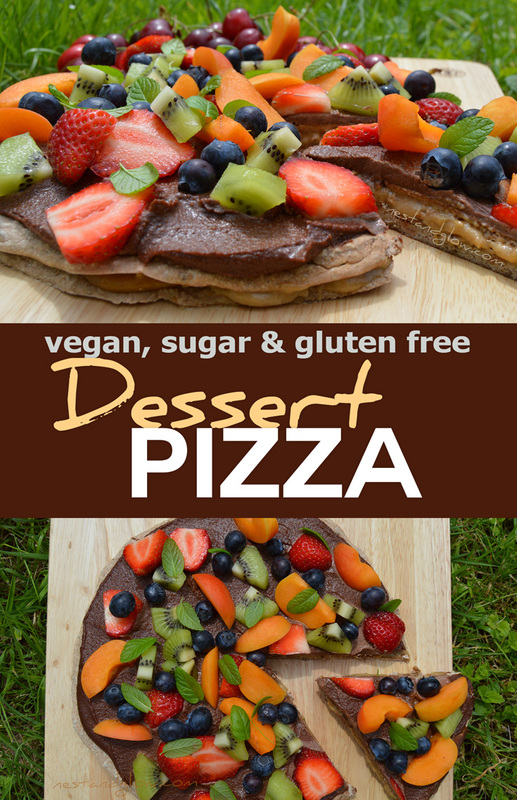 A decadent and filling dessert pizza that’s actually healthy. All the fats are raw unprocessed and it’s full of fibre so very satisfying and difficult to over eat. 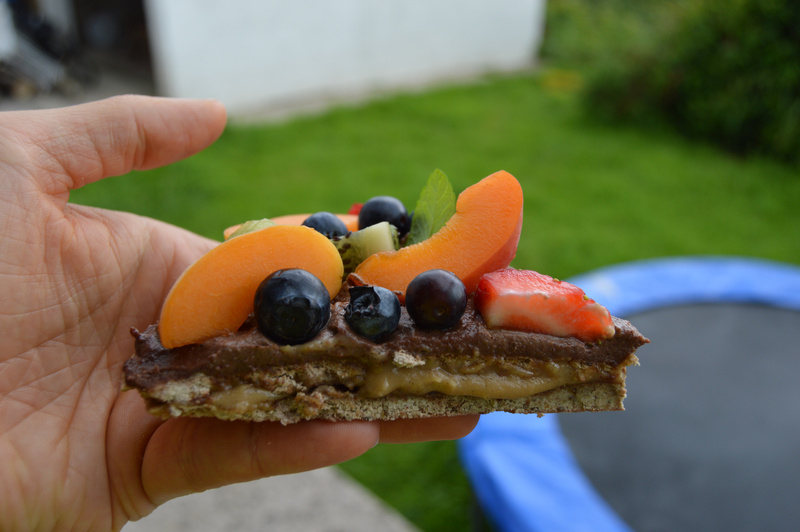 Just a small piece is very filling and rammed full of nutrition. It can be made raw using a dehydrator to set the basses. If you don’t have a dehydrator you can just bake them in the oven. Also the base can be made like a pancake in a frying pan if you’re short of time. A rainbow of fresh fruit chopped up & a few small mint leaves. For the photos I used strawberries, apricots, blueberries & kiwi. Add the buckwheat to a blender / food processor with the banana and chia seeds. Whizz until all is broken up and combined. Spread onto non stick sheets to make two 8 inch pizza bases. Cooked: Cook for about 20 mins at 180℃ until firm, then flip and cook for about 5 more mins until crispy. Raw: Dehydrate for 8 hours at 32℃, then flip and dehydrate for another 4 hours. Blend together all the cashew caramel filling ingredients until smooth. You may need to add a bit of water to make it totally smooth. Just add a tablespoon at a time. Spread the caramel on top of one of the pizza bases. Then place the other pizza base on top. To make the chocolate hazelnut sauce blend all together the same way as the caramel. You may want to grind up the nuts and nibs first if your blender isn’t powerful. 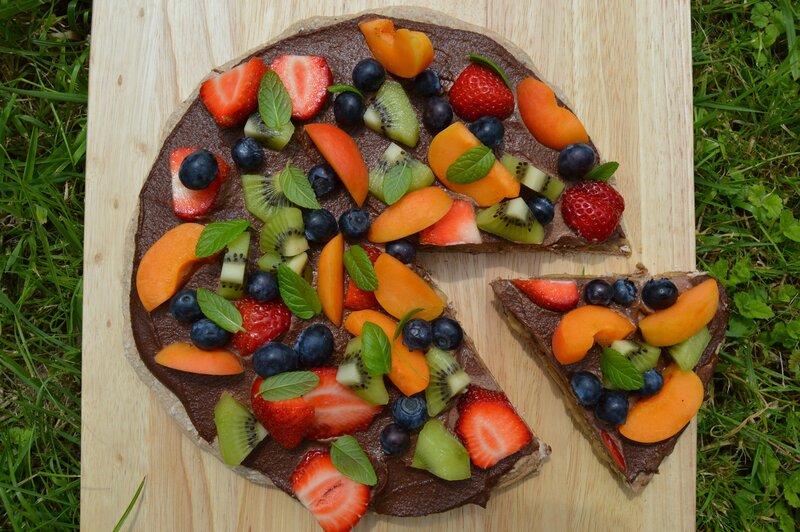 Spread the chocolate sauce on top, then sprinkle on the fruit and mint leaves. It will last for 4 days in the fridge and makes 10 generous portions. Made this lovely desert pizza over the weekend. The kids loved it! And managed to get copious amounts of fruit into them as a result! Amazing! The adults loved it too!! ?? ?